Create your own forum right now! Create your own Forum Now! We take great pride in our core features that create a forum offers. Our gallery system is unmatched from any other forum hosting service provider. And we also have many addons such as a chat room system, download system, store, and classifieds system which you can either order on it's own or get them all with our ultimate plan. Create A Forum also has a built in system that allows you to sell adspace and place ads on your forum when you are on ultimate plan for forum hosting. Supports unlimited posts, topics, boards, subforums. Includes an advanced permission system to control permissions by member groups. 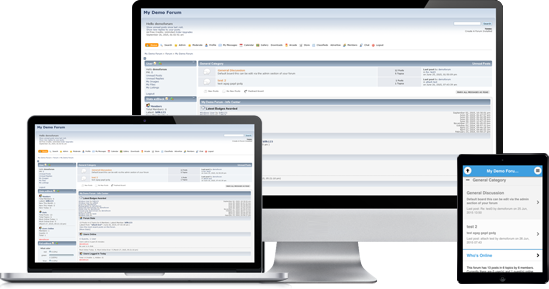 Included EzPortal gives you the power to build a custom forum site with ezBlocks and add custom pages to your forum. We also have an arcade system with over 1000+ games to install for your forum members. Allows all members to share their pictures with each other, comment on pictures, start their own personal gallery, and much more included. Allows you to grow your forum and start your own business. The eCommerce system is an addon for your forum which allows you to sell both digital and physical products. With the the classifieds system for your forum allows all of your members to have auctions and listings with the option to charge a fee to list an item. You have the option to park your own domain and remove branding from your hosted free forum to grow your community. Here is some of the feedback that clients have left us over the years with the Create A Forum hosting service. Create A Forum's intuitive solution includes a free standard plan to get admins up and running plus feature-rich upgrades at budget-friendly prices. Read more on HostingAdvice.com. I am amazed with your service the features are outstanding! Thank you for your support Create A Forum and helping my forum become a success.